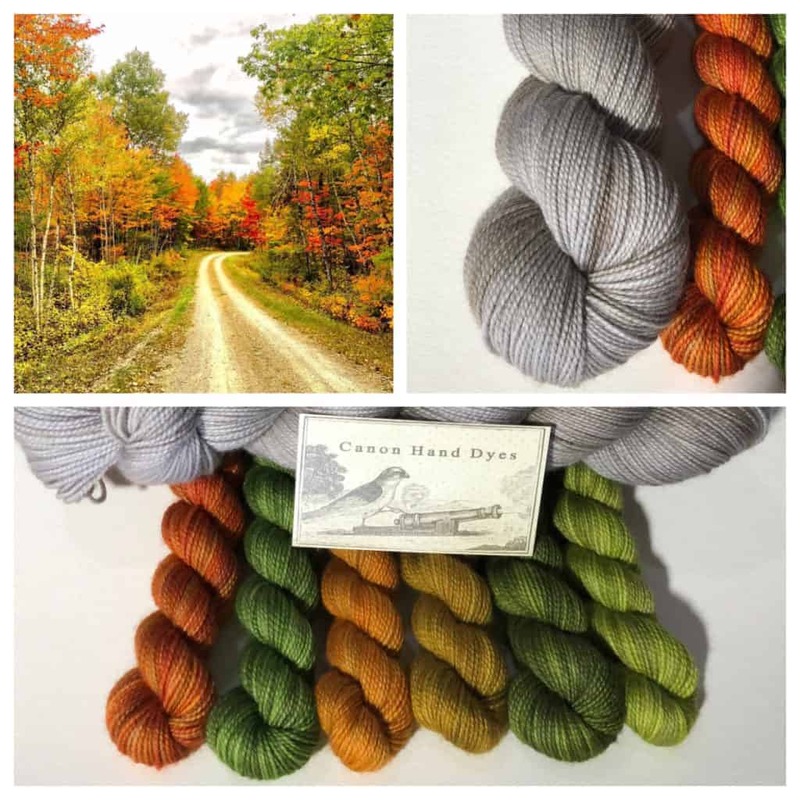 July’s Spirit Trail Fiberworks subscriber inspiration colorways are based on a photo sent to Jennifer by Amy (the podcaster behind Hudson Valley Knits) of bits of colored glass — I guess it’s river glass? 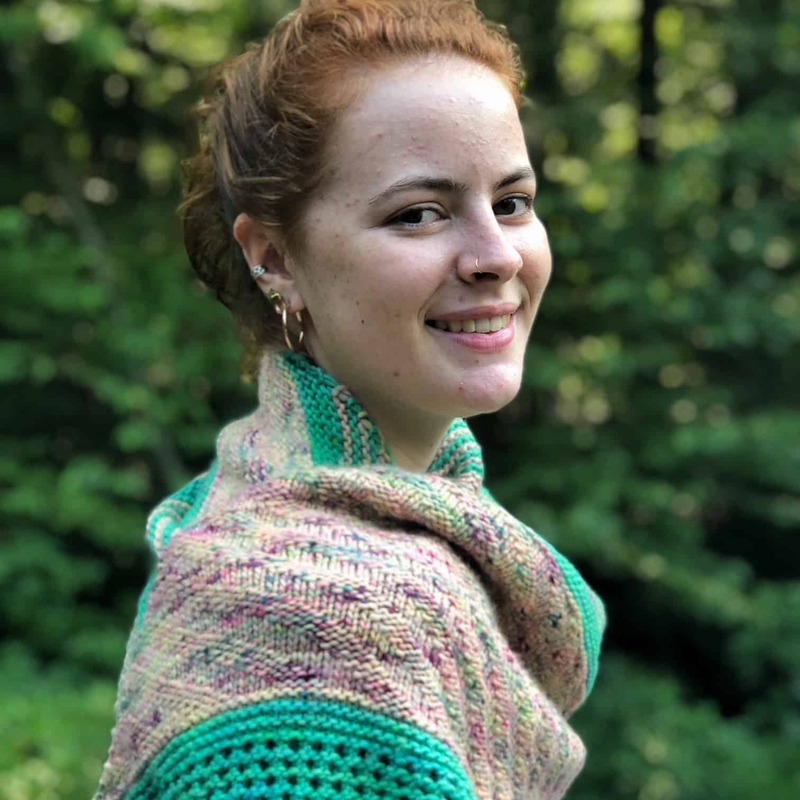 — she’s found on her walks along the Hudson River. 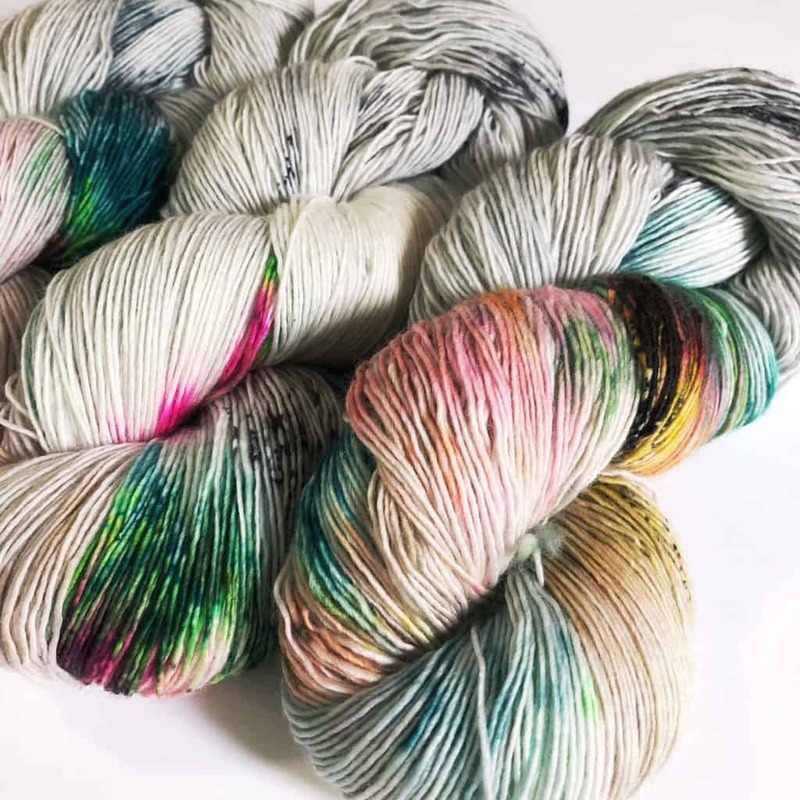 River Walk is a subtle speckle of the glass colors on a soft gray background, Bottle Glass is a light blue reminiscent of the little bit of blue in the photo, and Beach Treasure is a soft amethyst-pink. 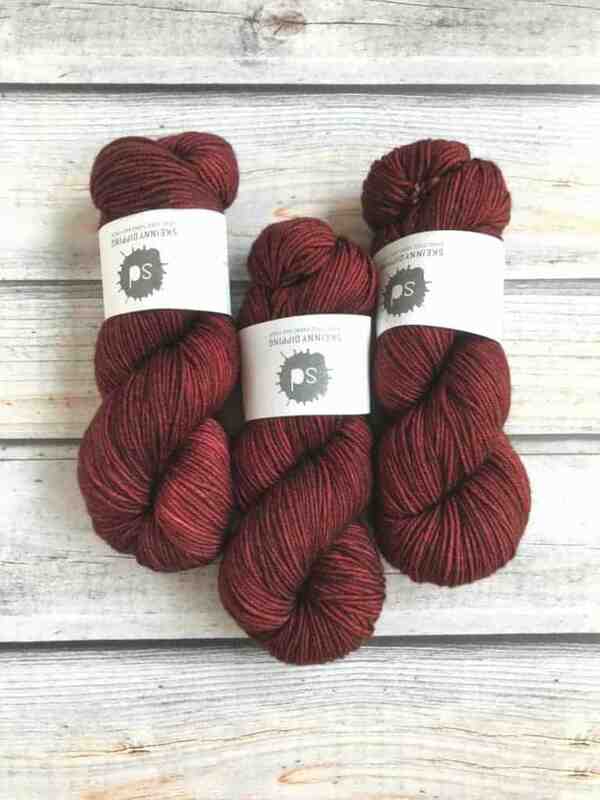 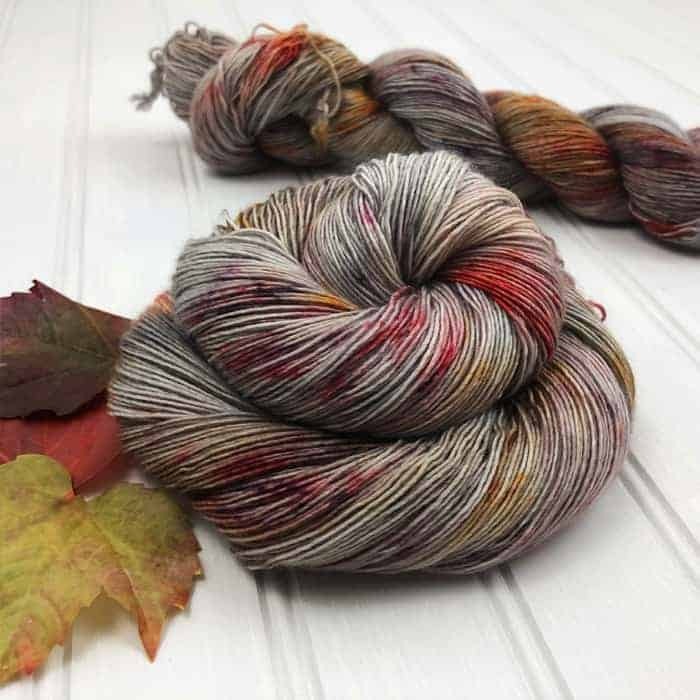 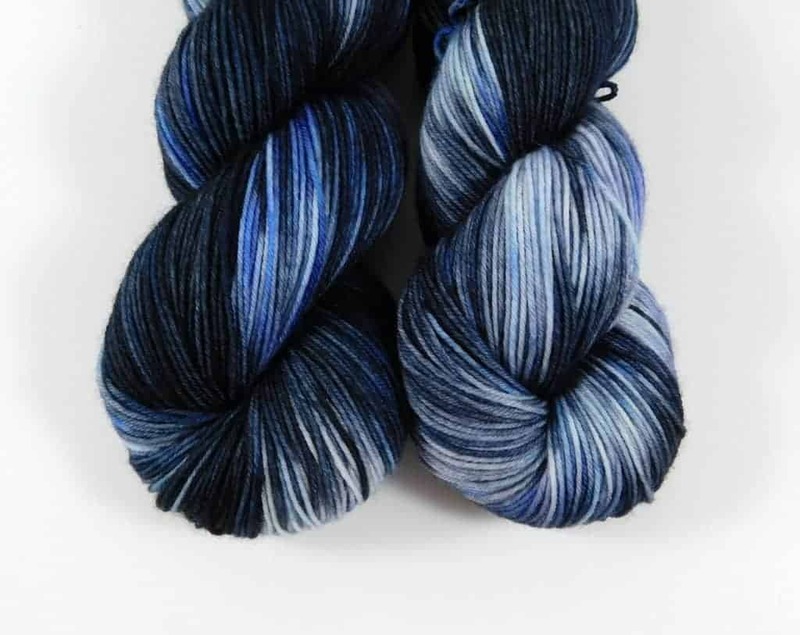 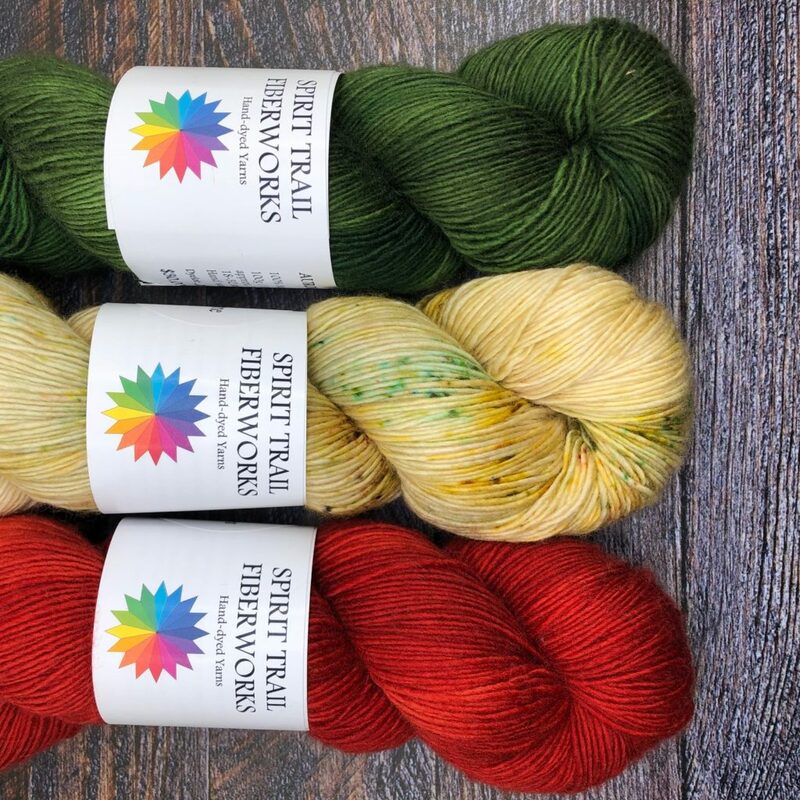 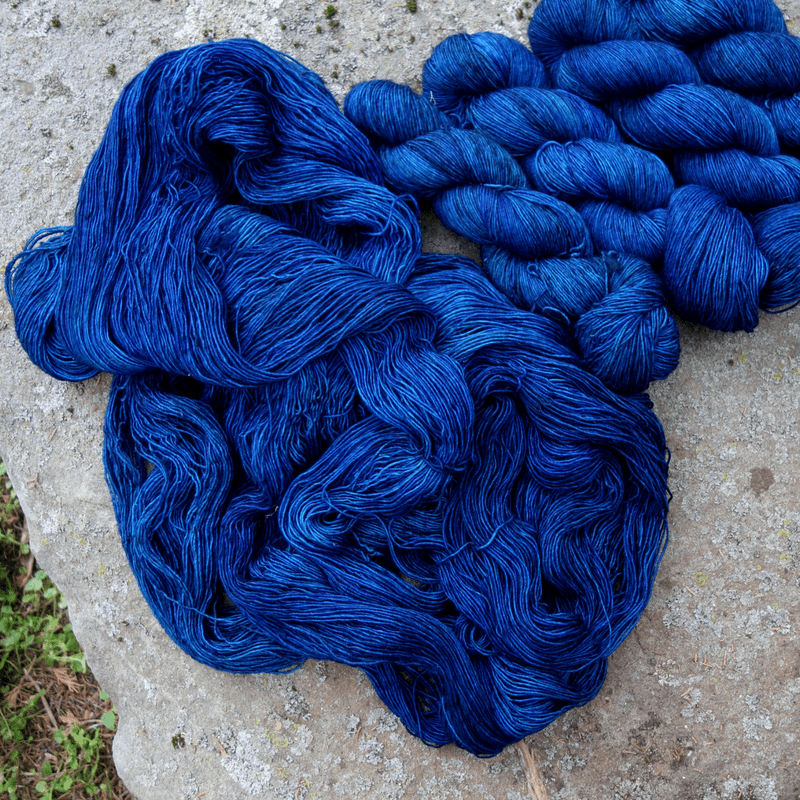 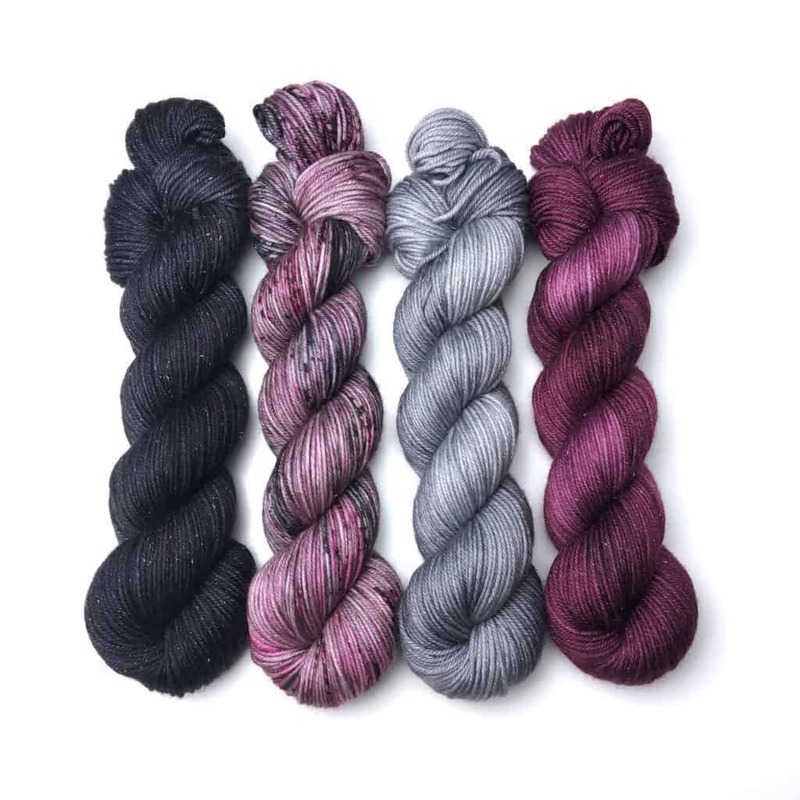 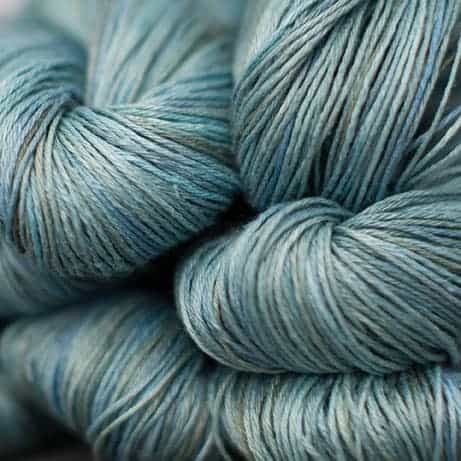 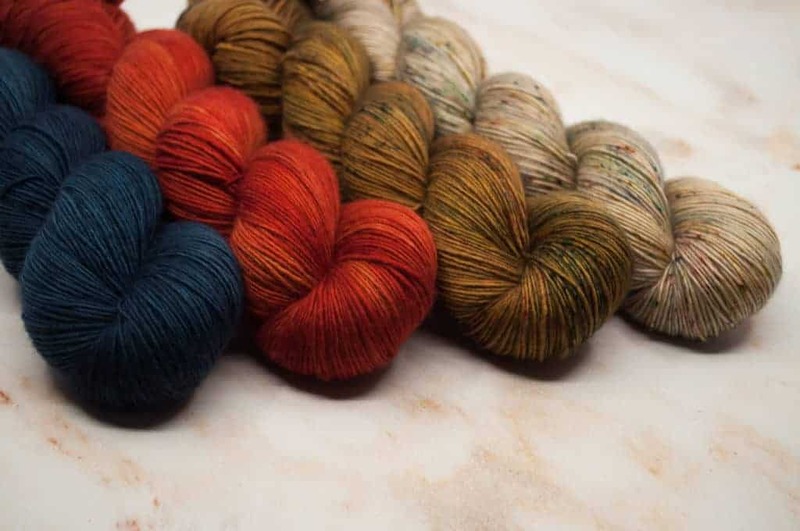 The three colorways are available on the Dyed-to-Order page of the Spirit Trail Fiberworks website until July 25. 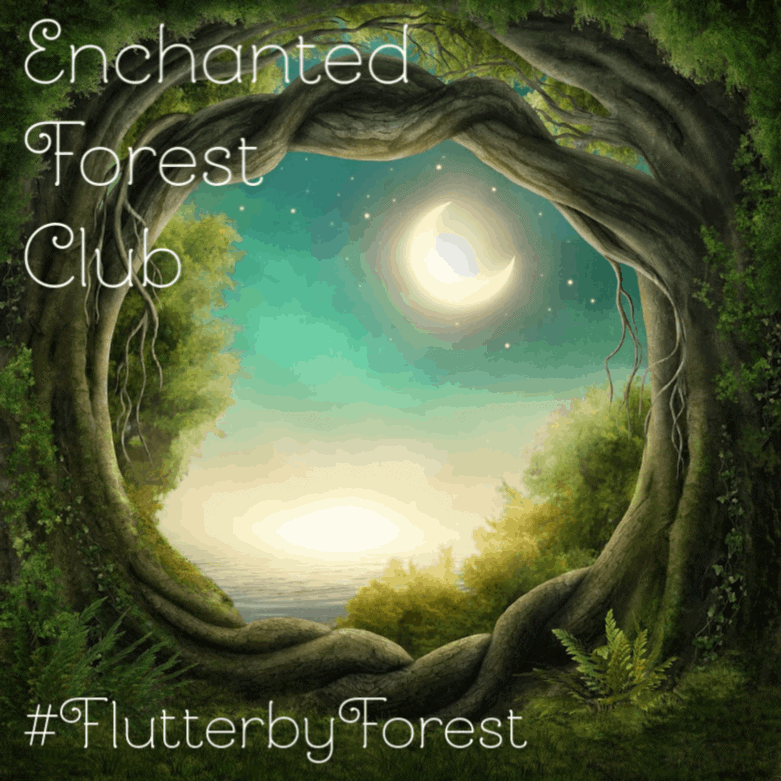 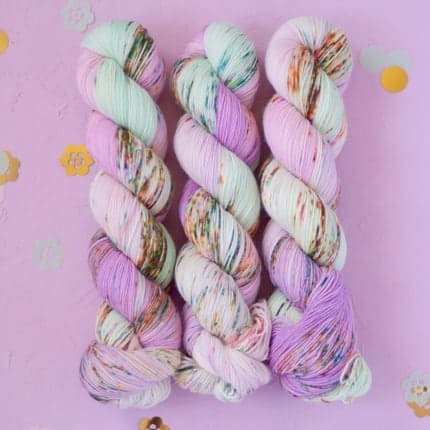 Crafty Flutterby Creations’ Go Anywhere Club is inspired by Reading Rainbow (and there’s no yarn involved, so it’s totally Stash Guilt Free!). 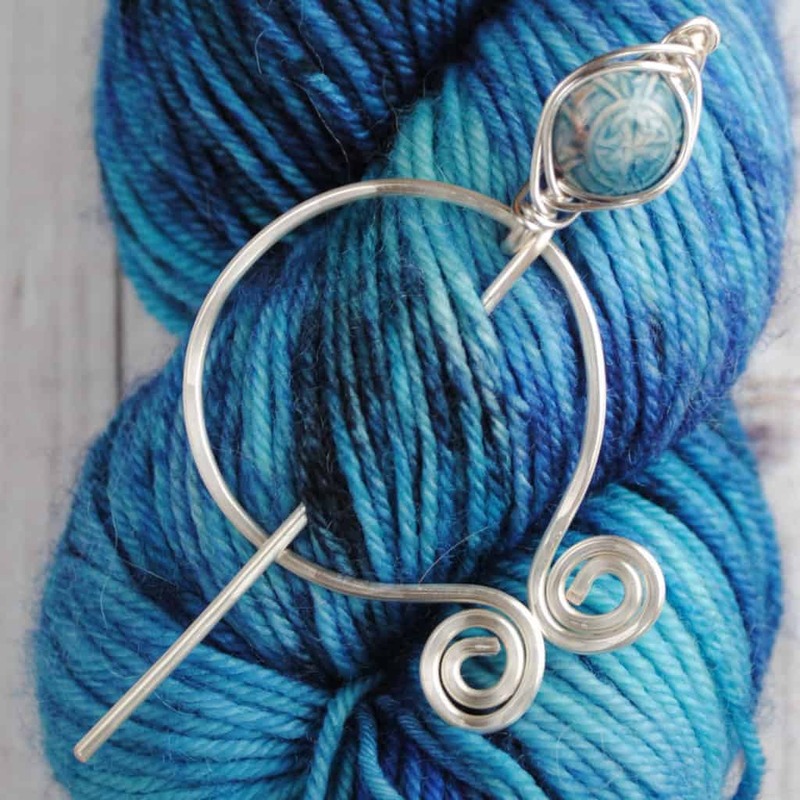 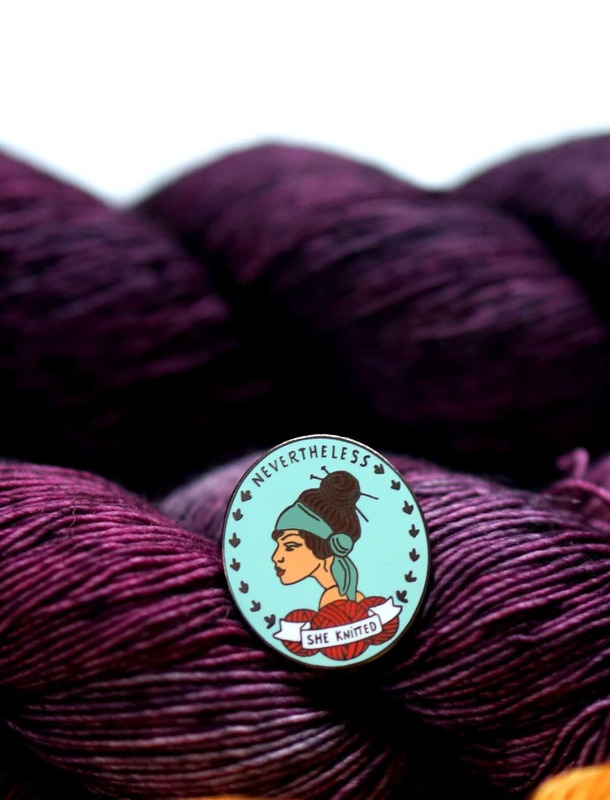 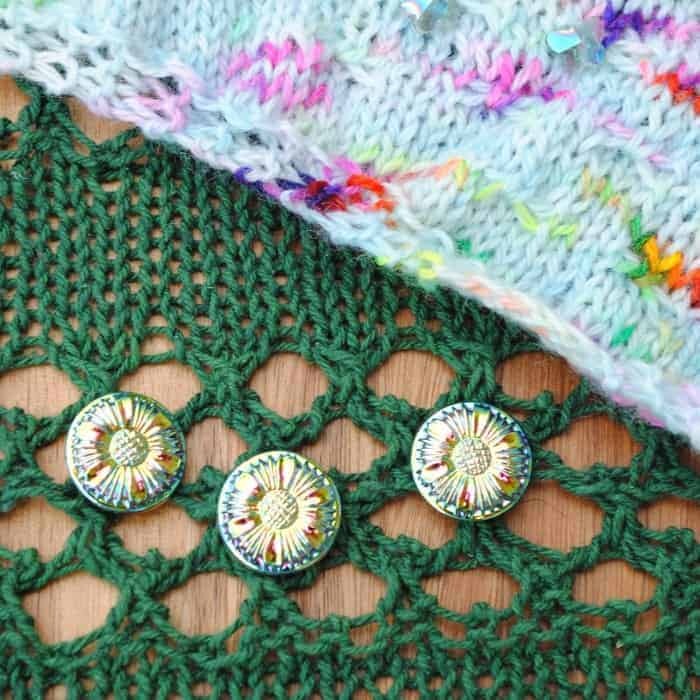 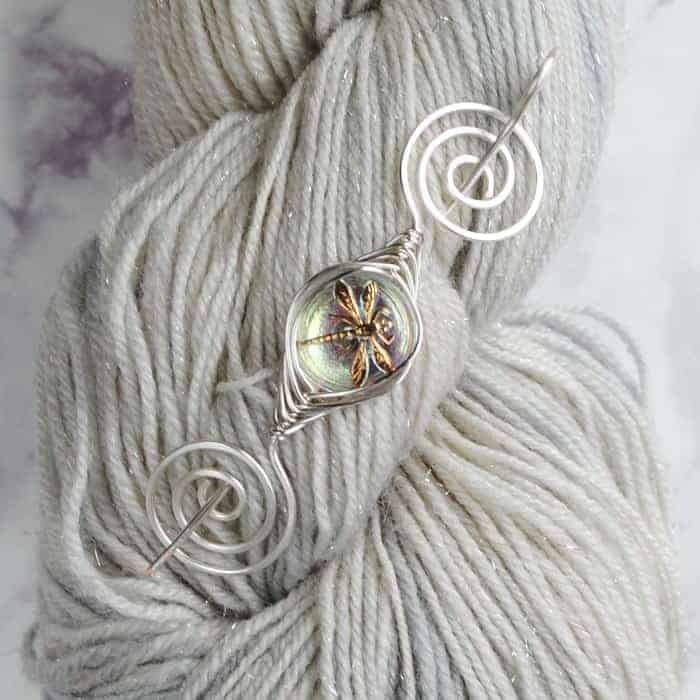 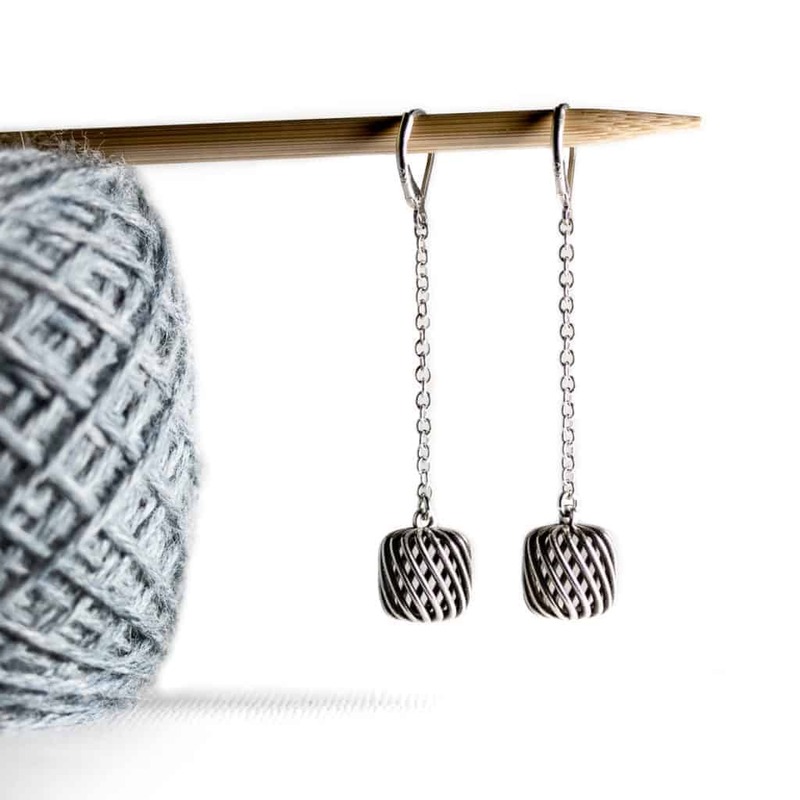 Each month’s shipment includes an exclusive shawl pin, a new knitting pattern with yarn suggestions and bonus goodies. 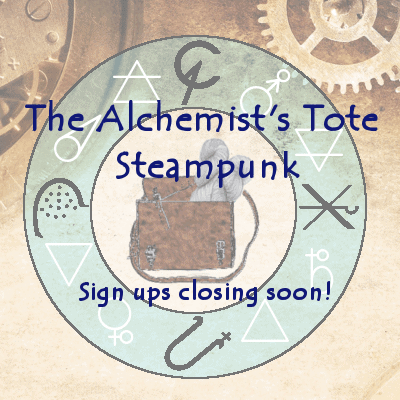 Sign-ups close July 27. 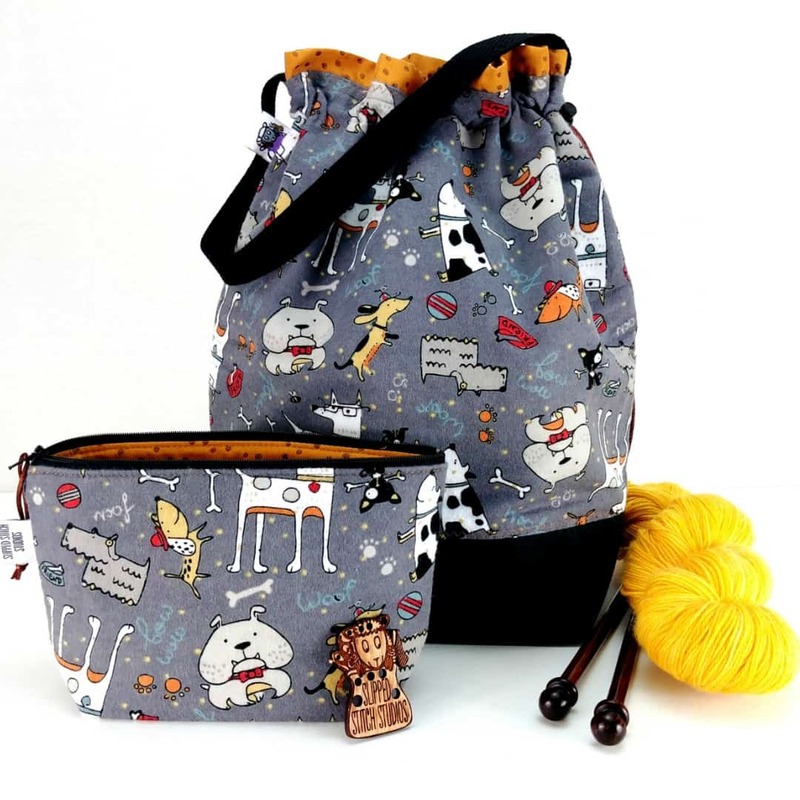 It’s raining cats and dogs — again! 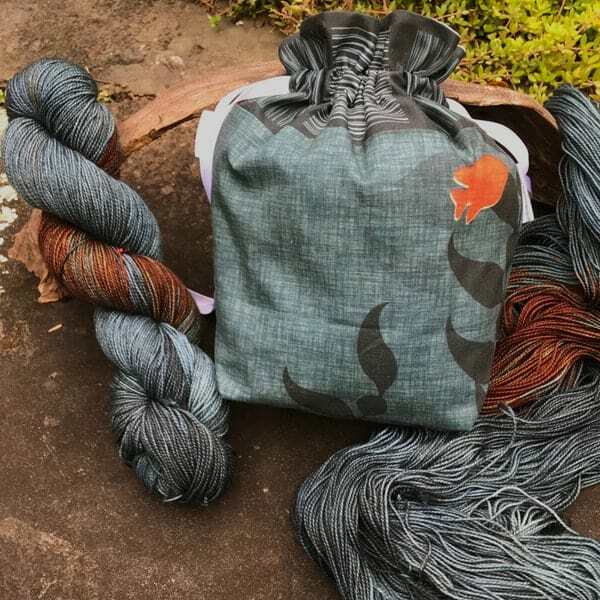 — at Slipped Stitch Studios. 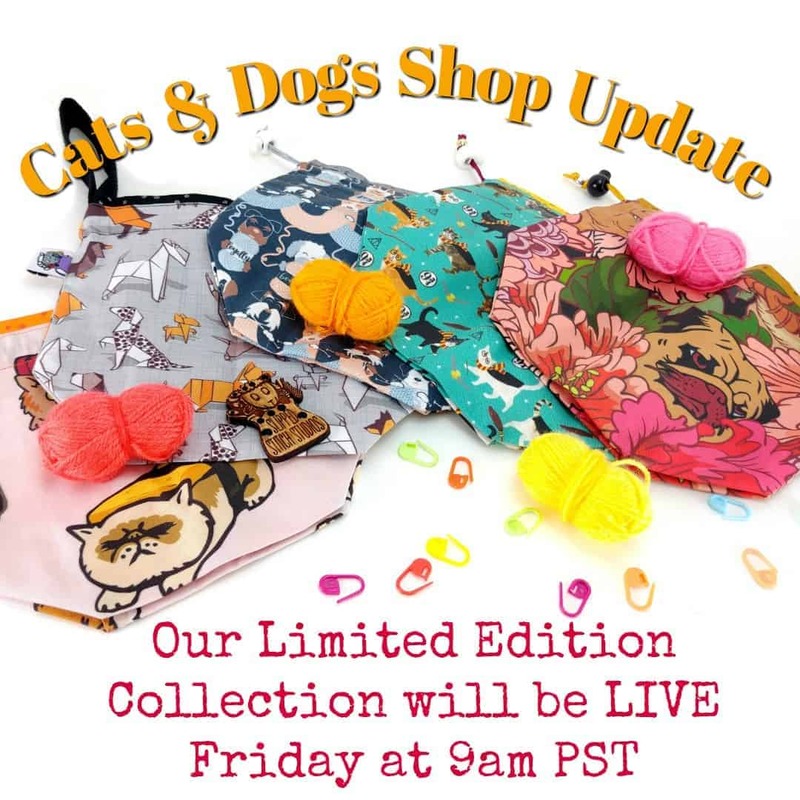 This limited collection goes live today at 9 a.m. Pacific time. 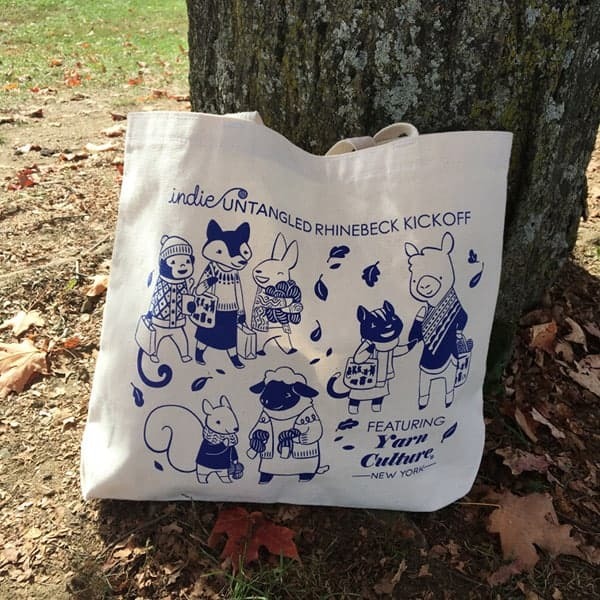 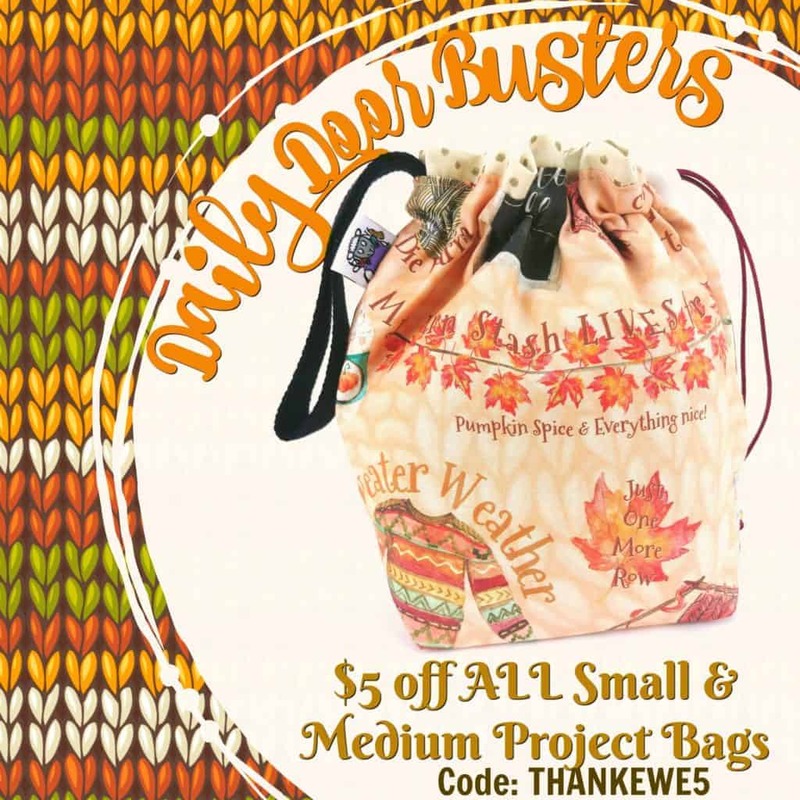 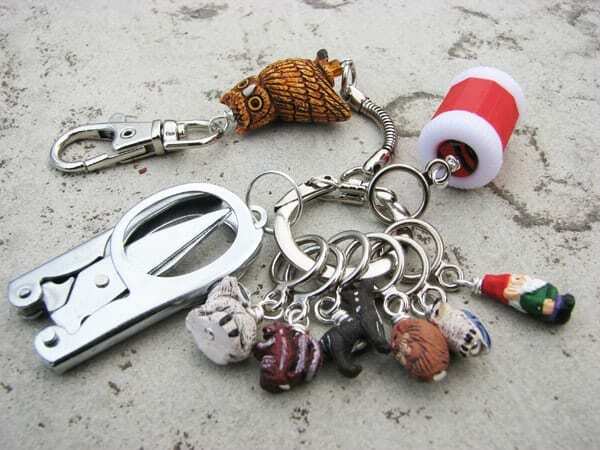 Check out the Sheep Squeezer bags from One Sock Wonder and get free U.S. shipping. 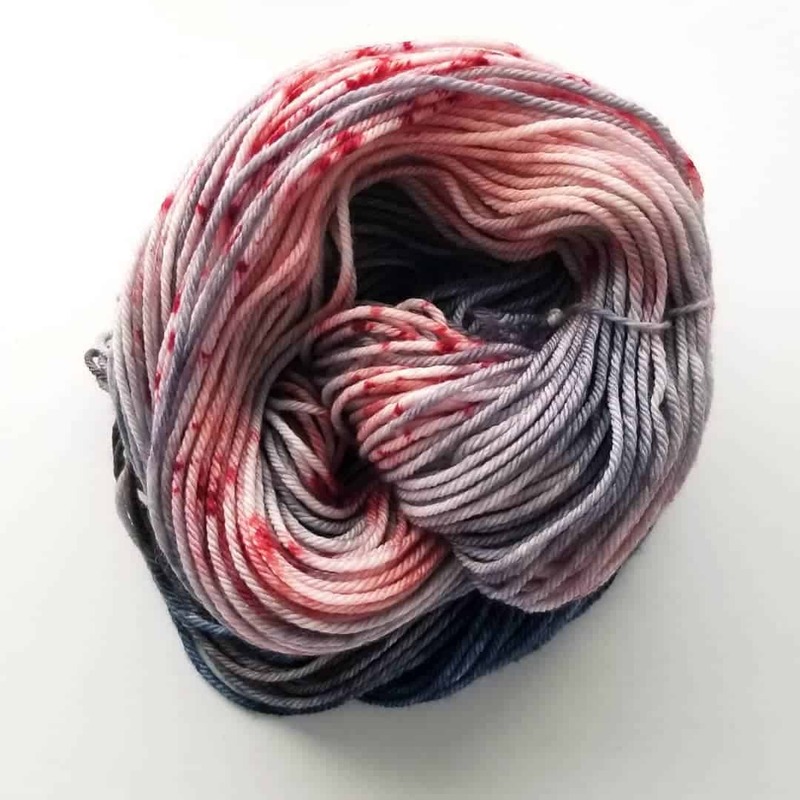 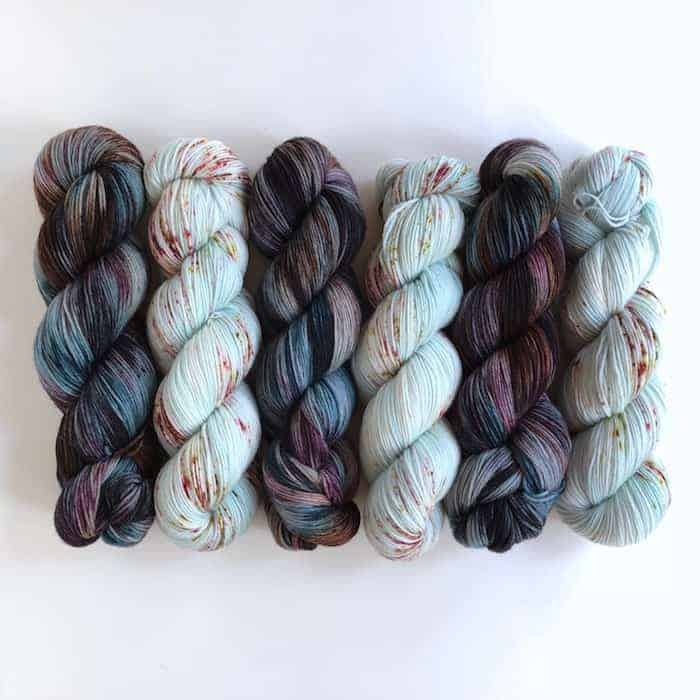 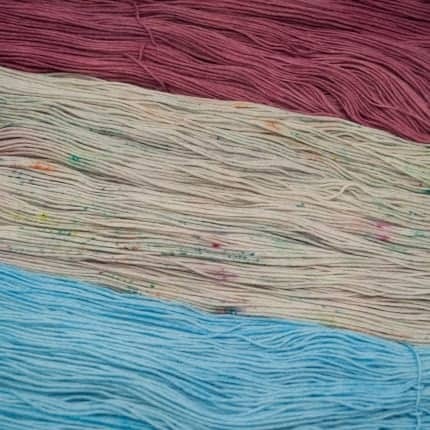 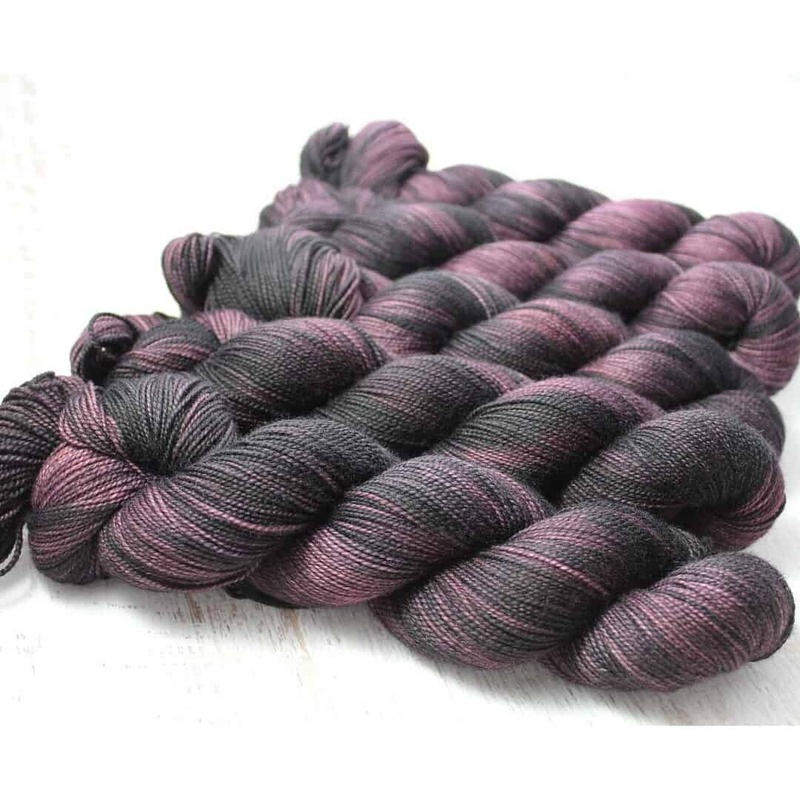 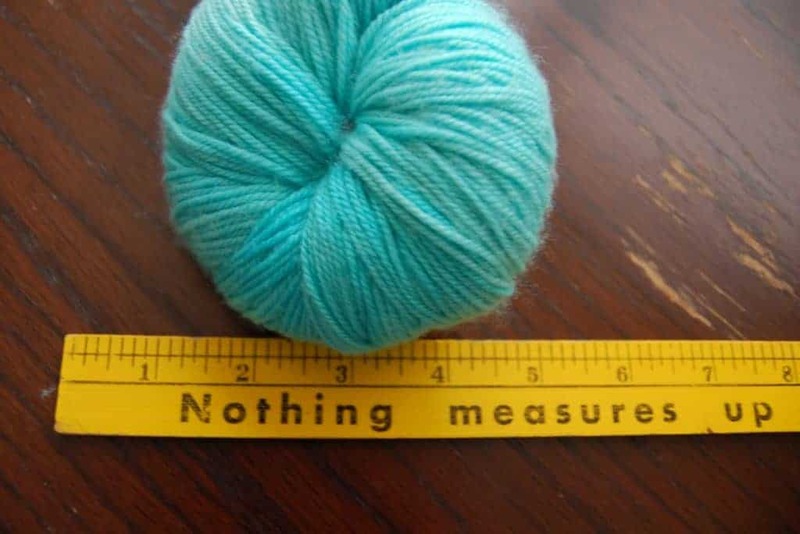 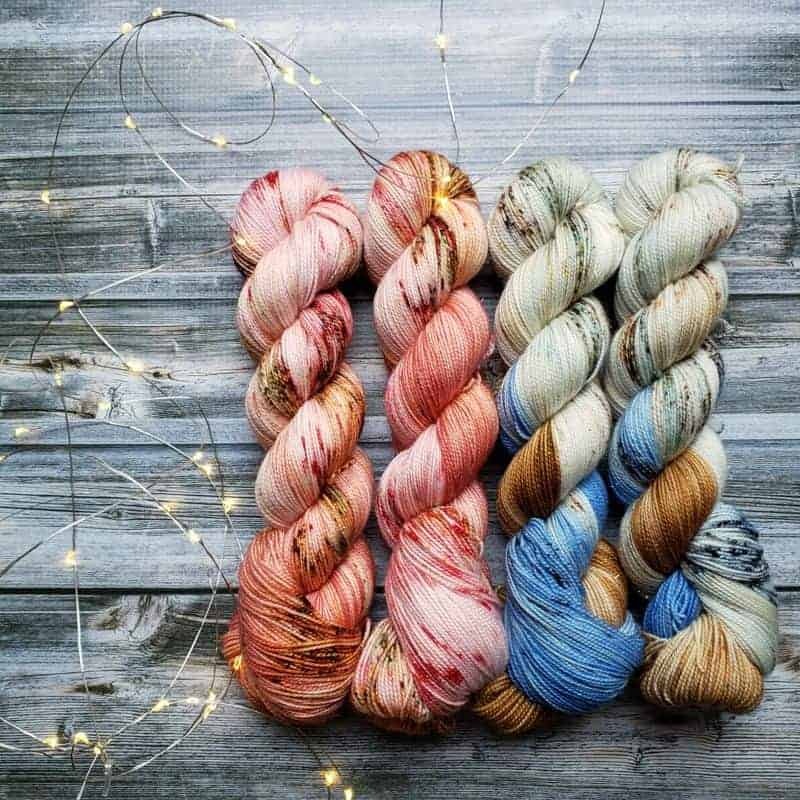 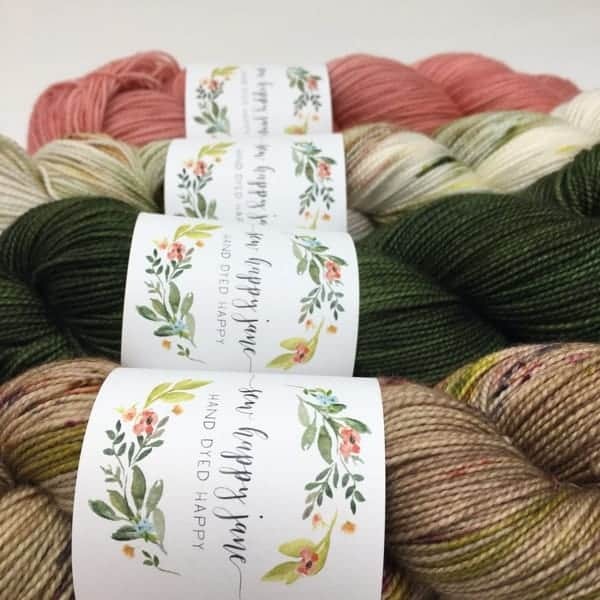 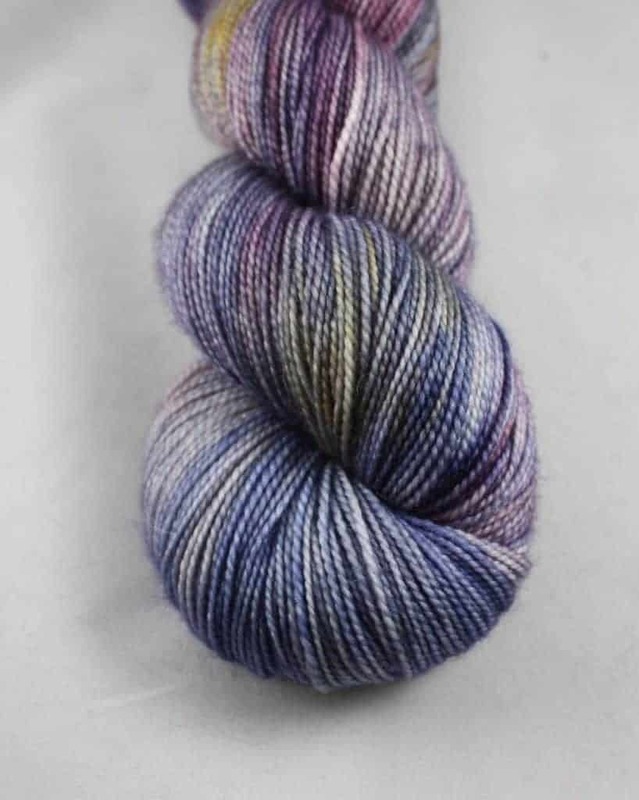 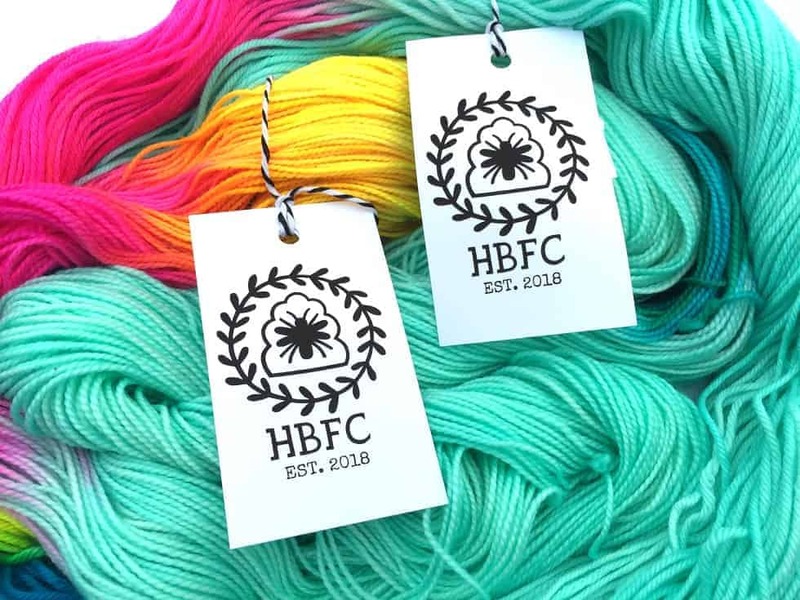 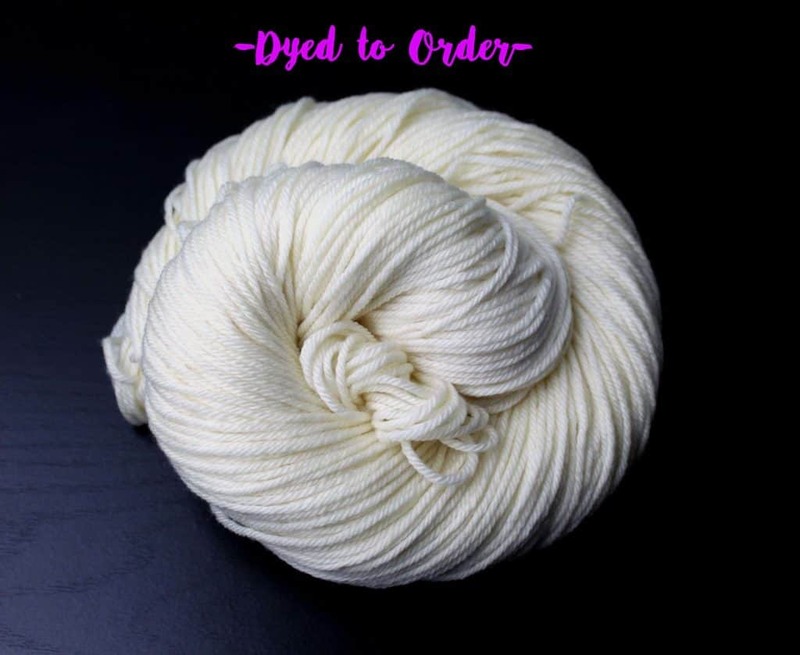 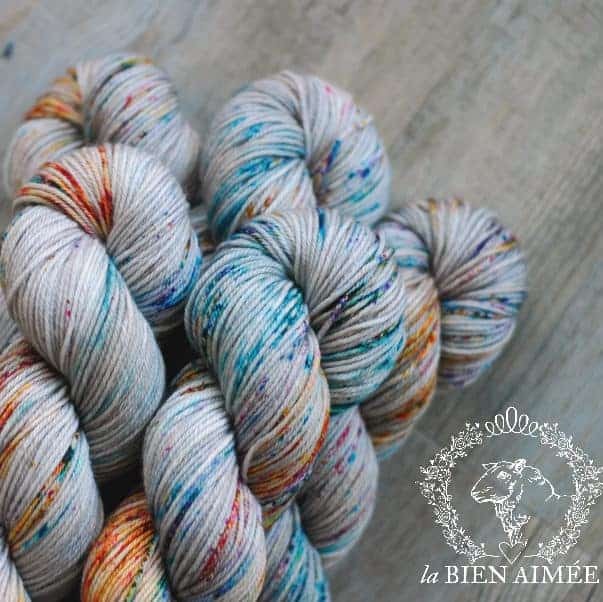 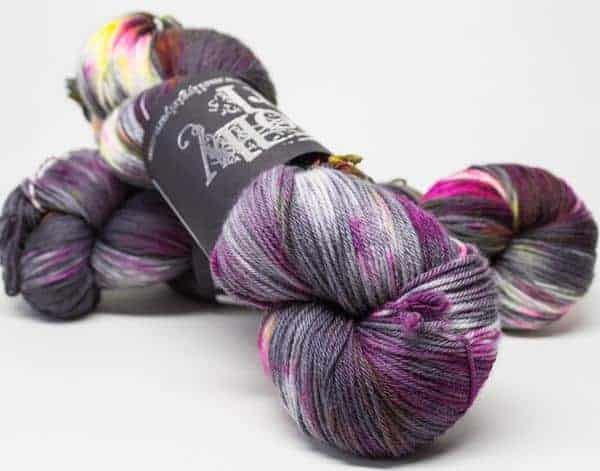 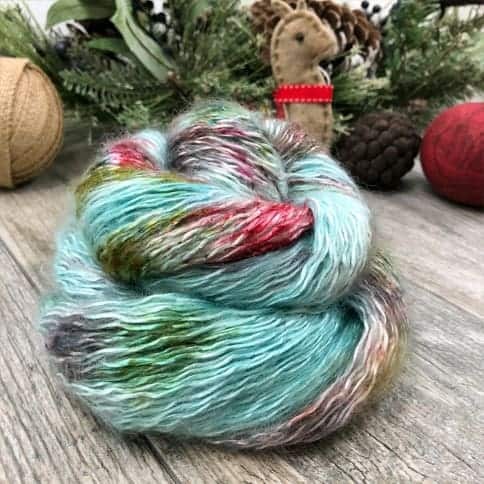 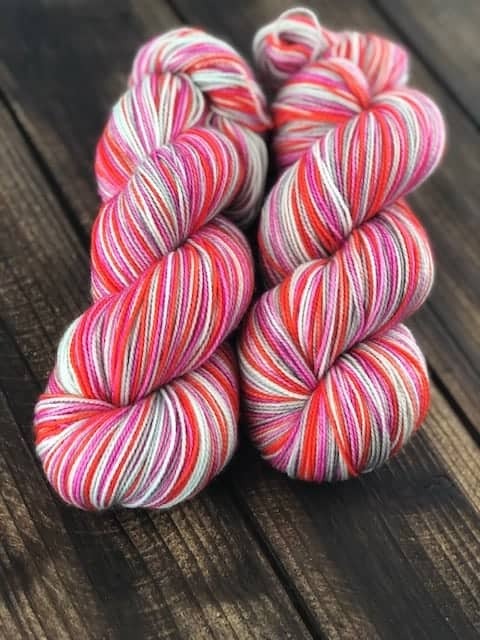 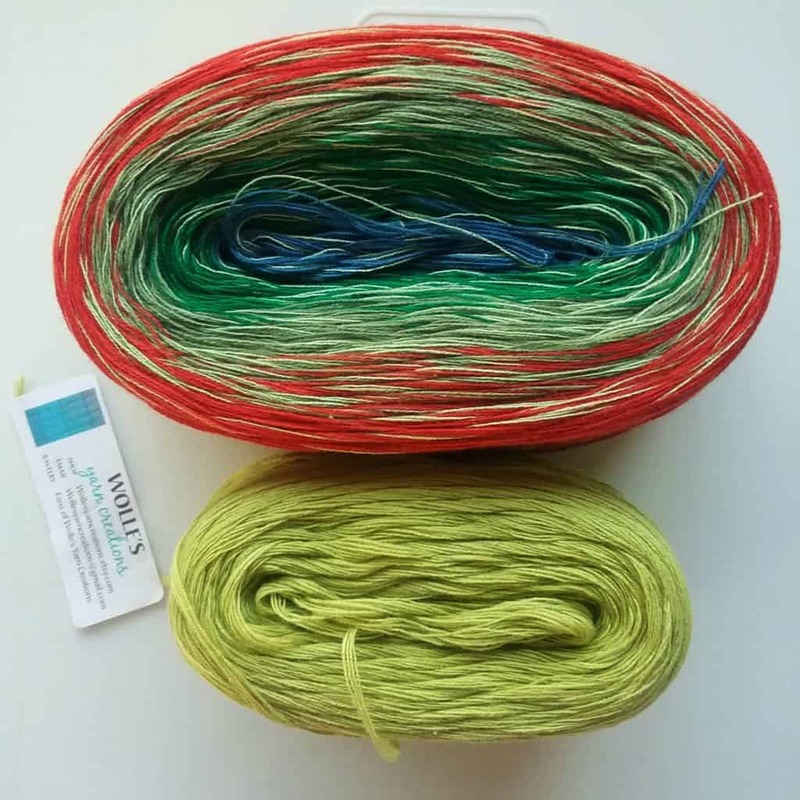 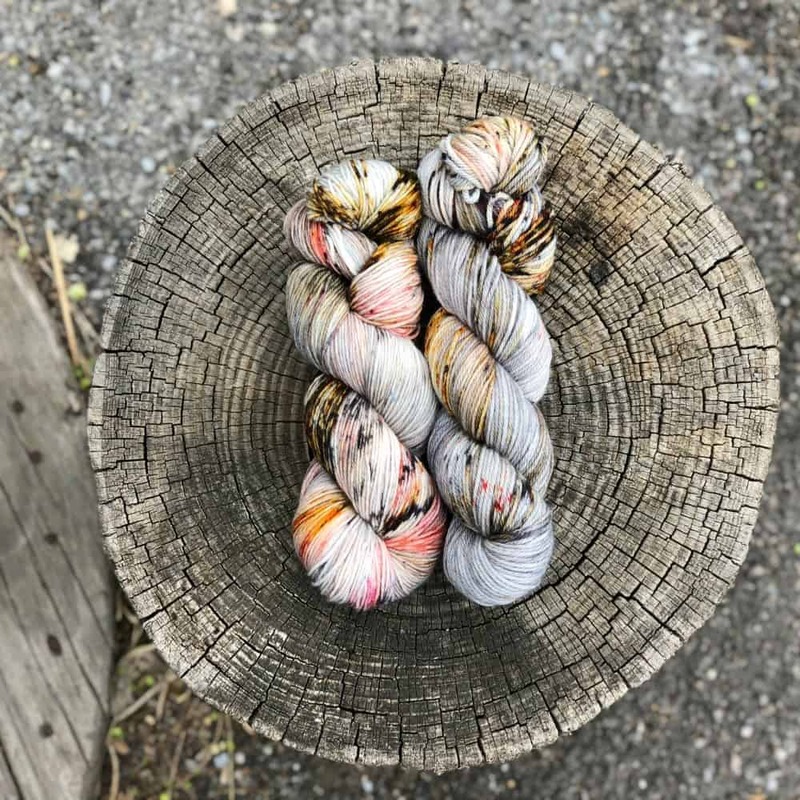 If you’re looking for some summer knitting, Kate of McMullin Fiber Co. has her shop stocked with plenty of singles and sock yarns. 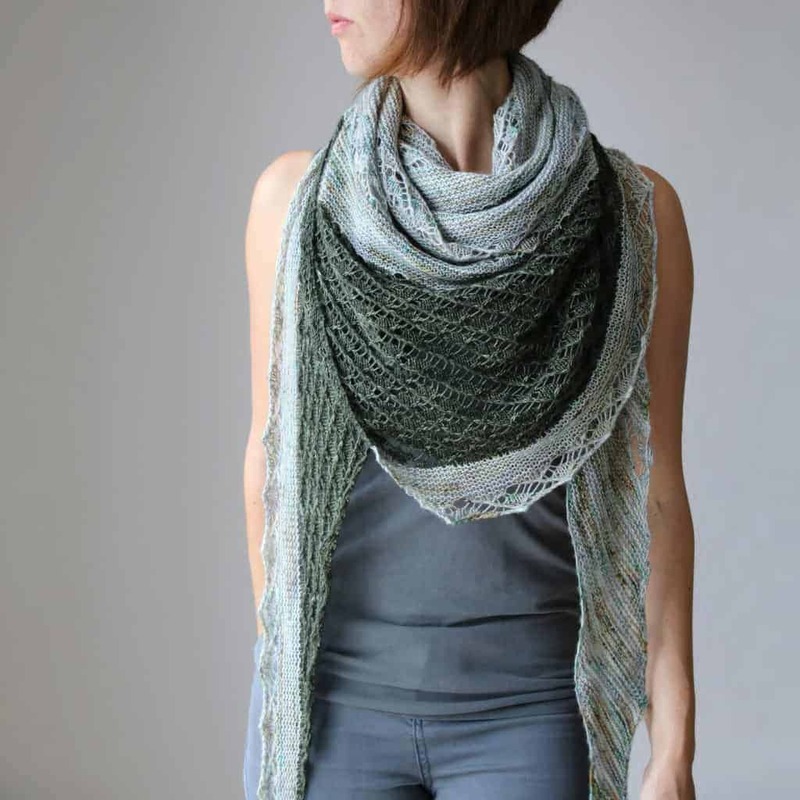 She recommends Posh Skinny for light transition sweaters like Caitlin Hunter’s Tegna. 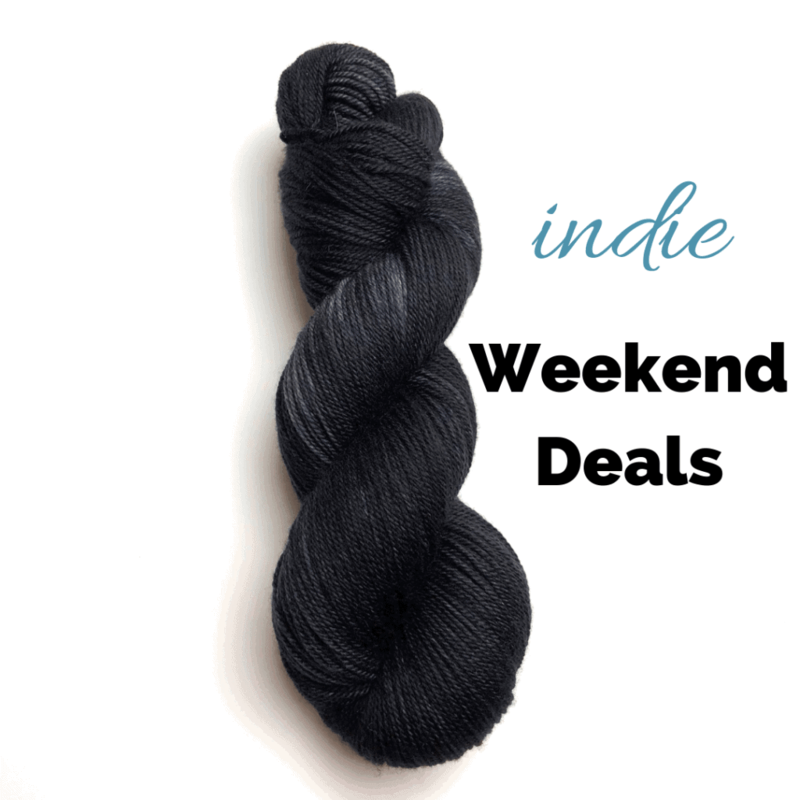 Since you’re an Indie Untangled reader, you get an exclusive discount! 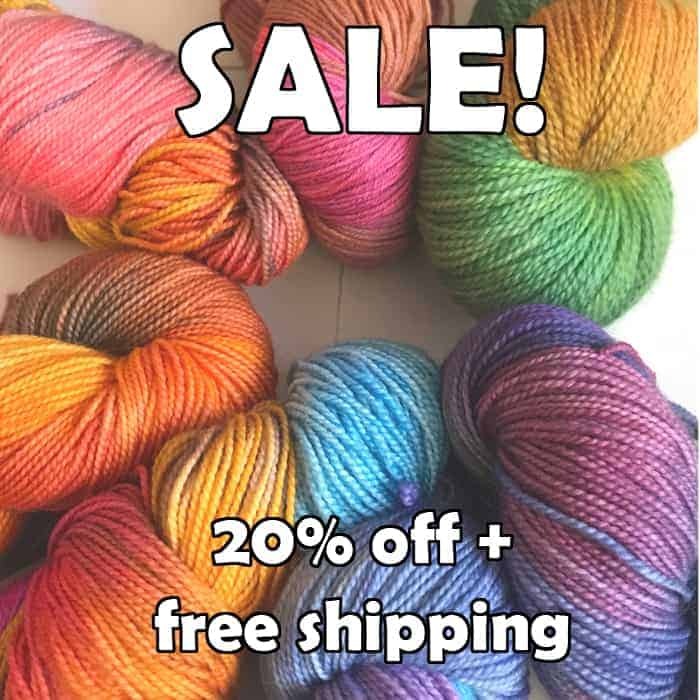 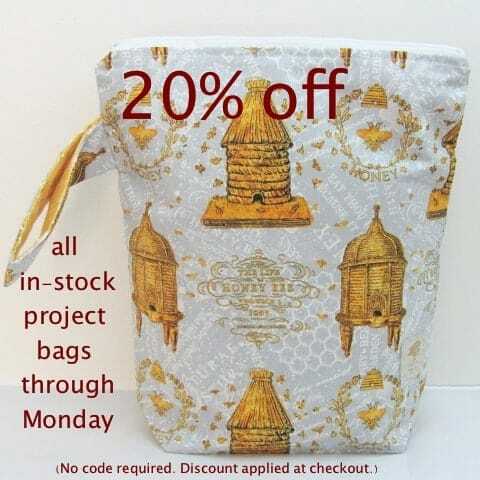 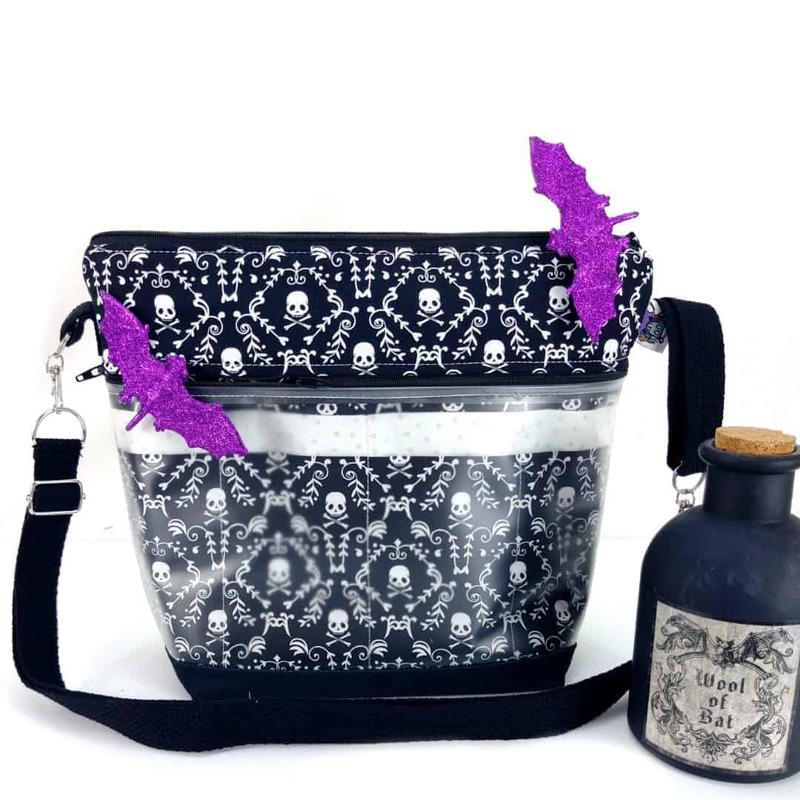 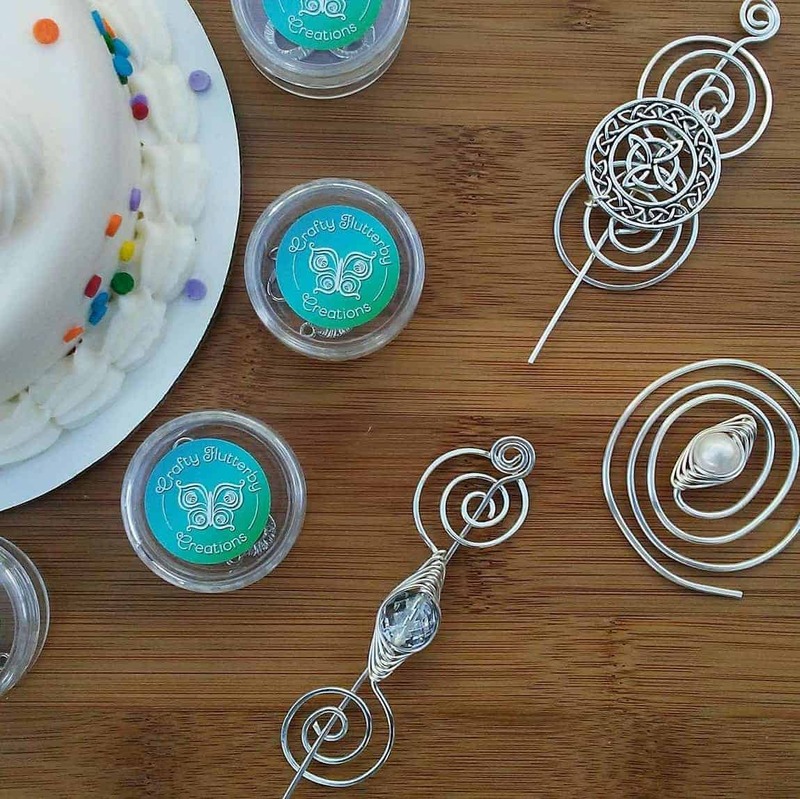 Use code UNTANGLED20 for 20% off any purchase through the end of this month. 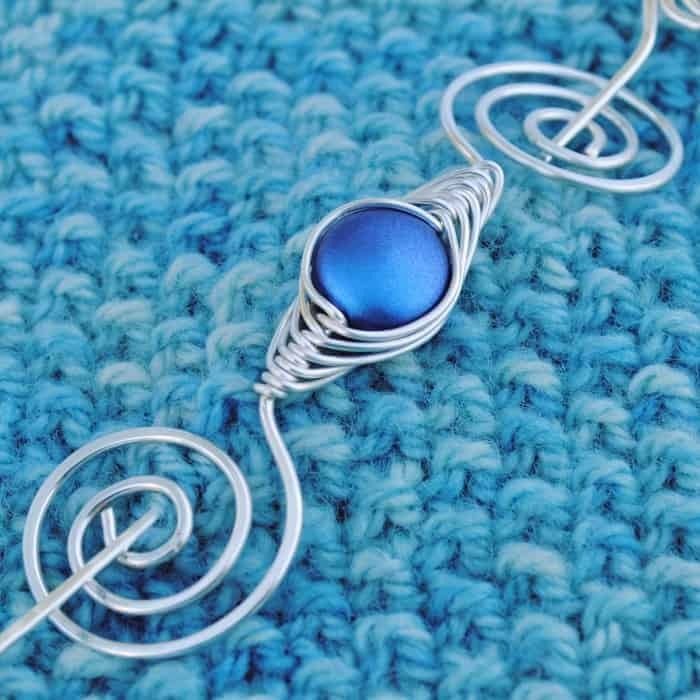 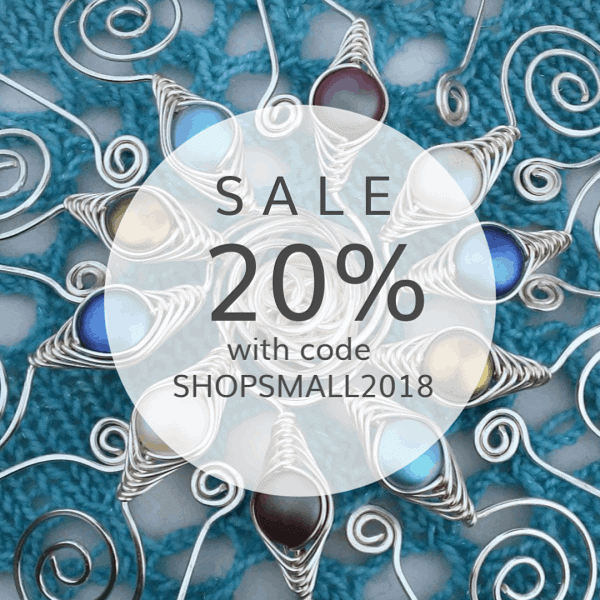 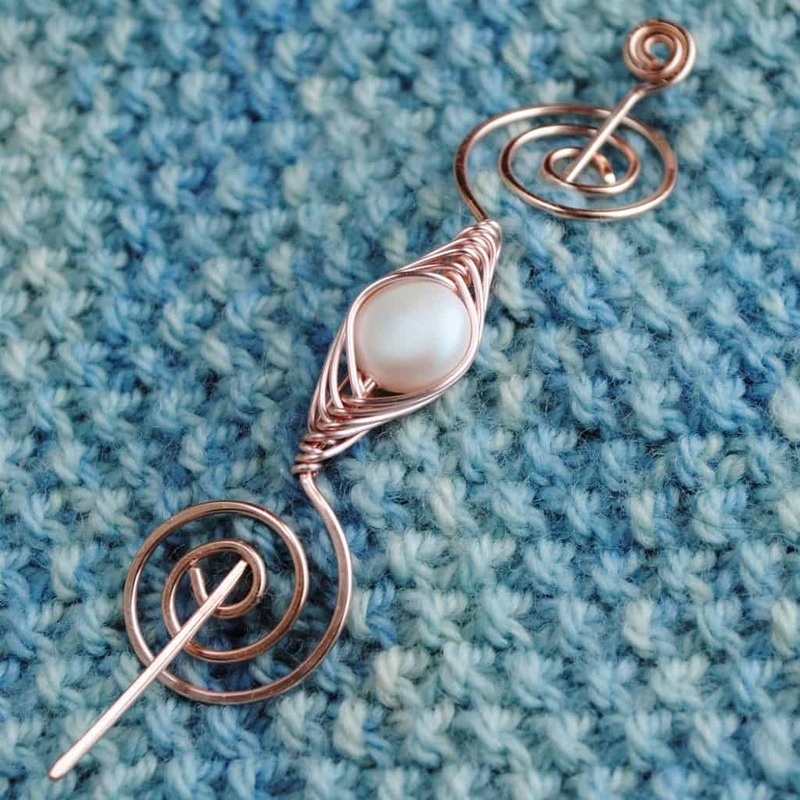 If you’re more of a shawl person in summer, then check out Michelle’s latest shawl pin designs. 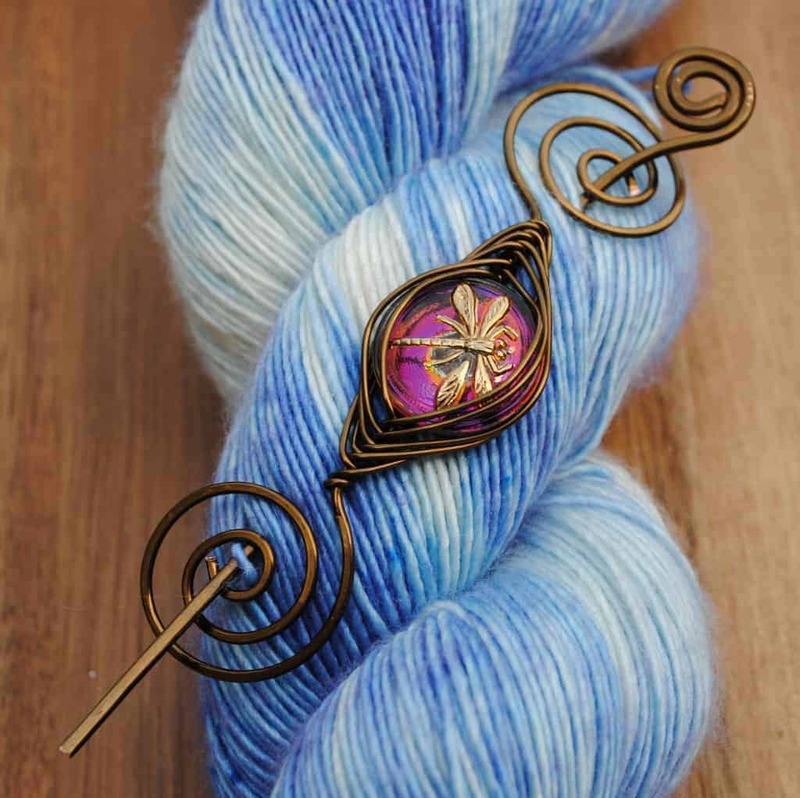 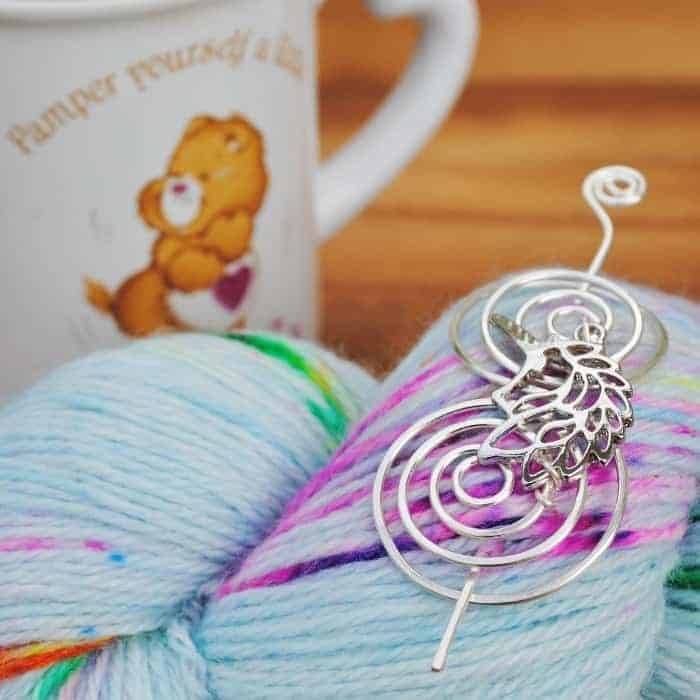 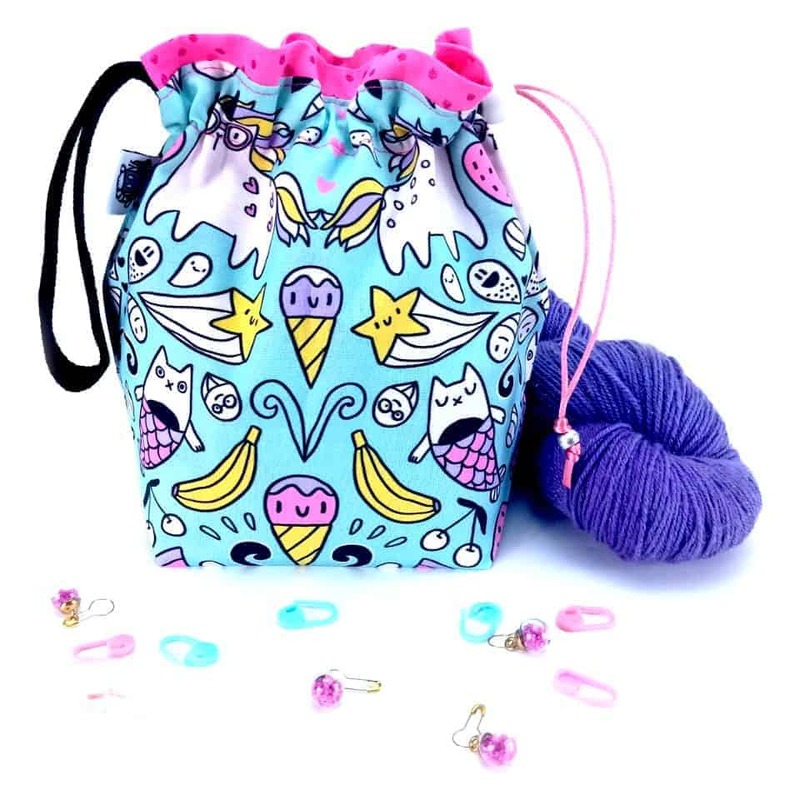 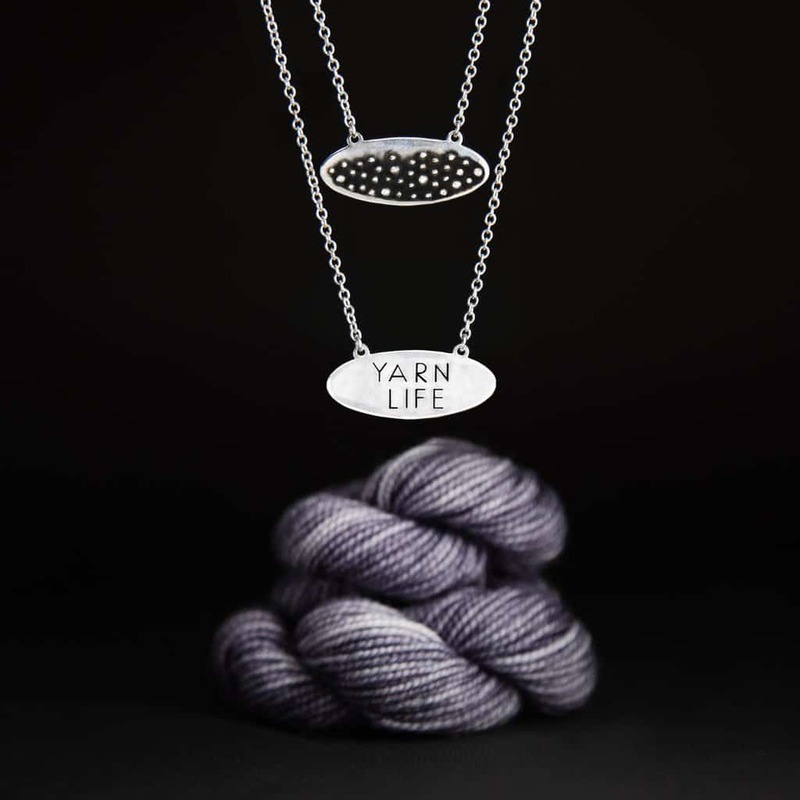 If you’re a blue or purple person, her Shimmering Violet Noteworthy Pin will complement yarn in many shades of blue, indigo, violet, lavender and lilac. 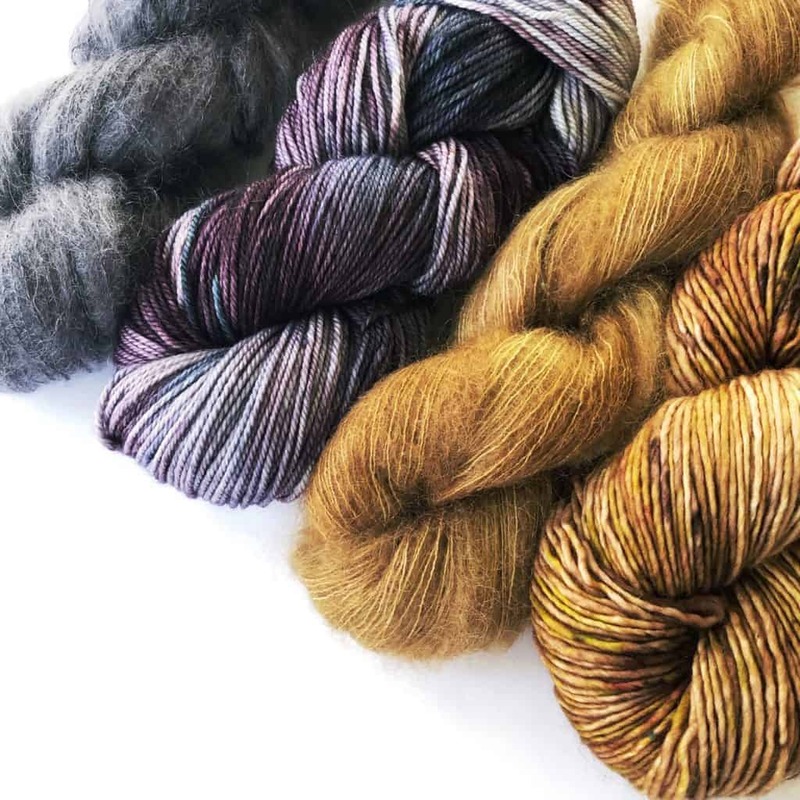 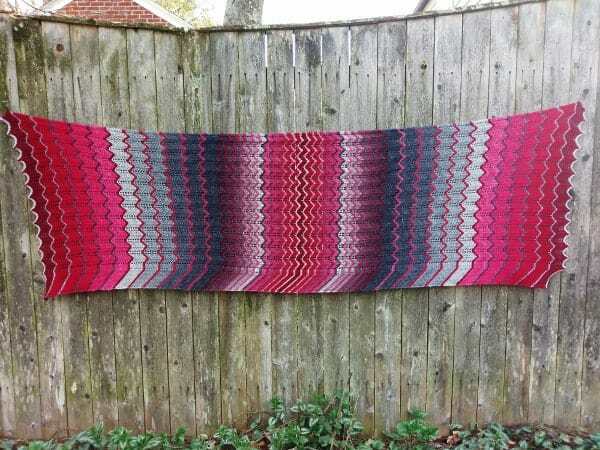 The QCC Yarn line continues to expand and just got its own website, separate from Ewe Sew An Sew. 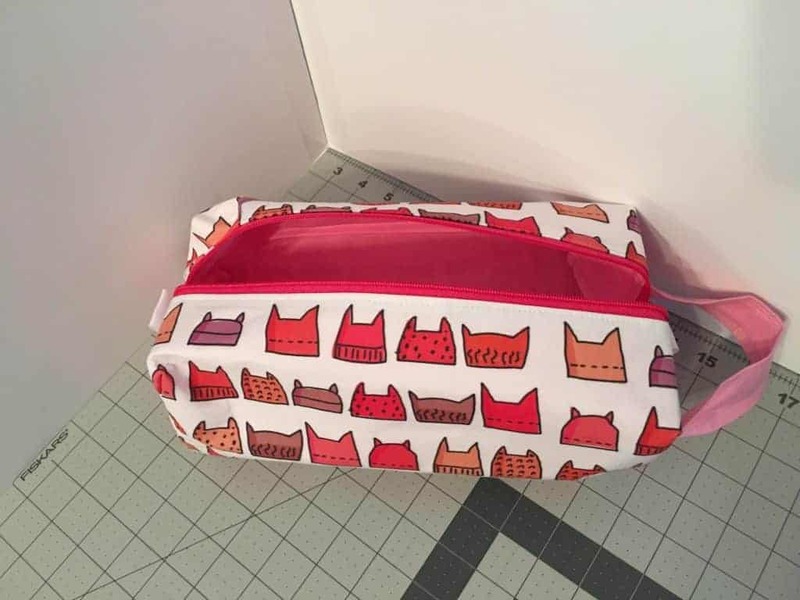 There’s also a rewards program called Happy Cats. 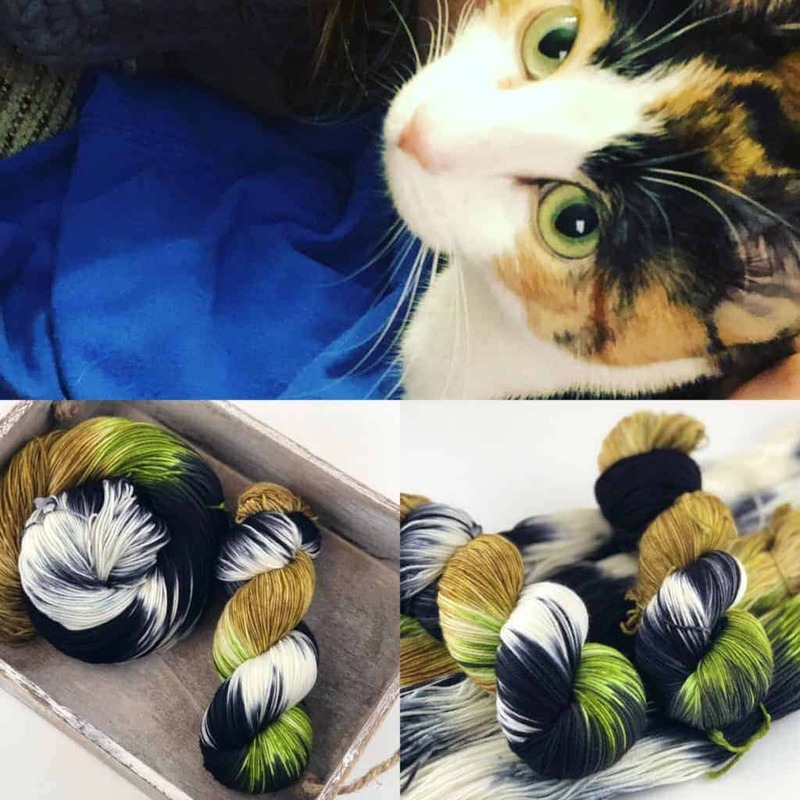 Just by creating an account you’ll get 200 Happy Cats, which can be redeemed for $5 off your next order. 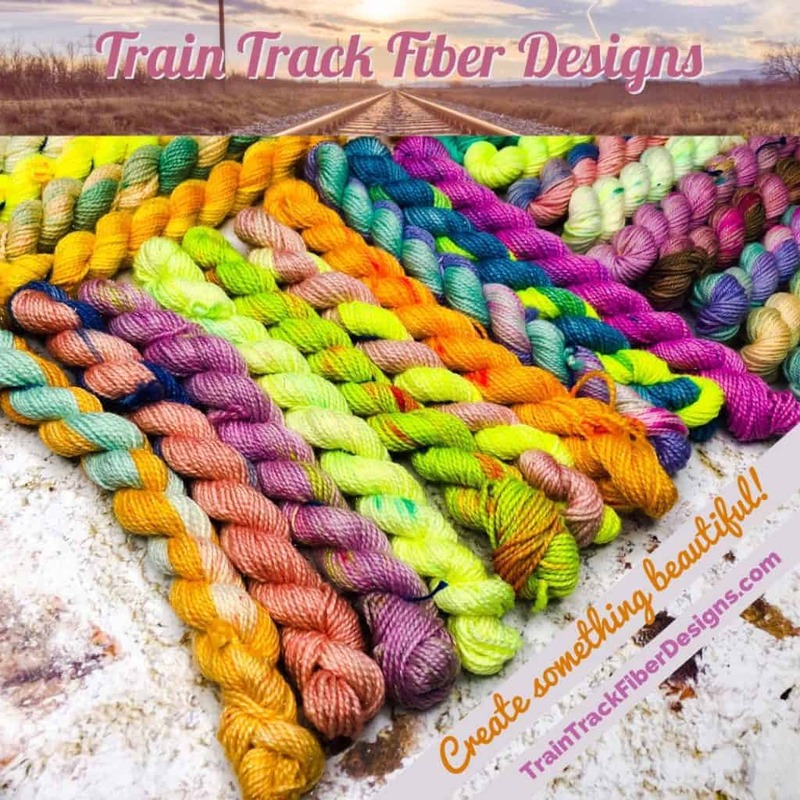 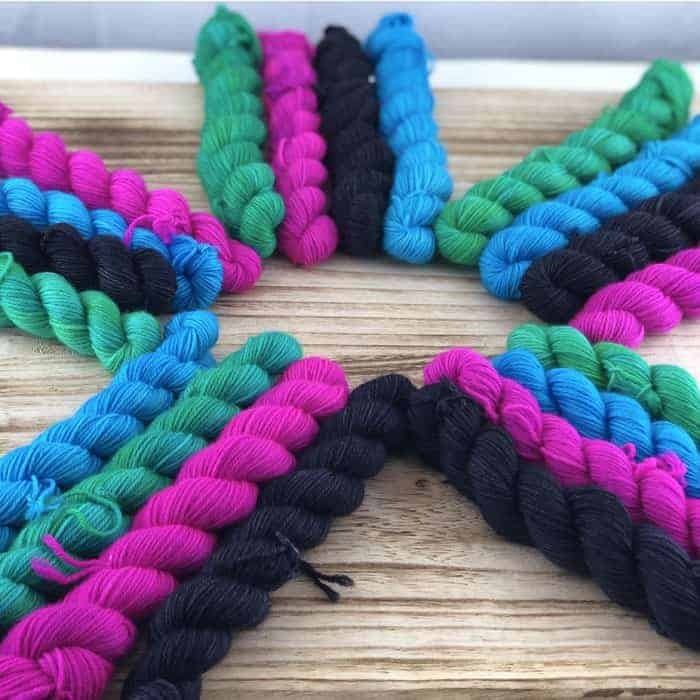 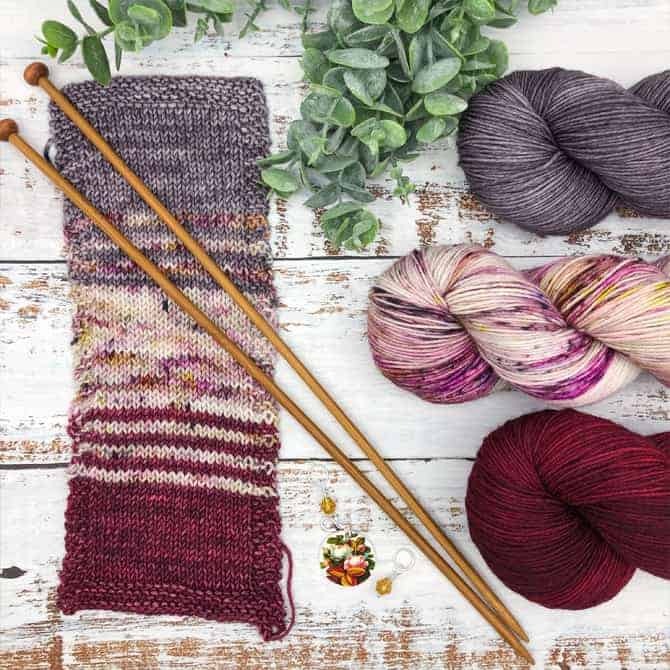 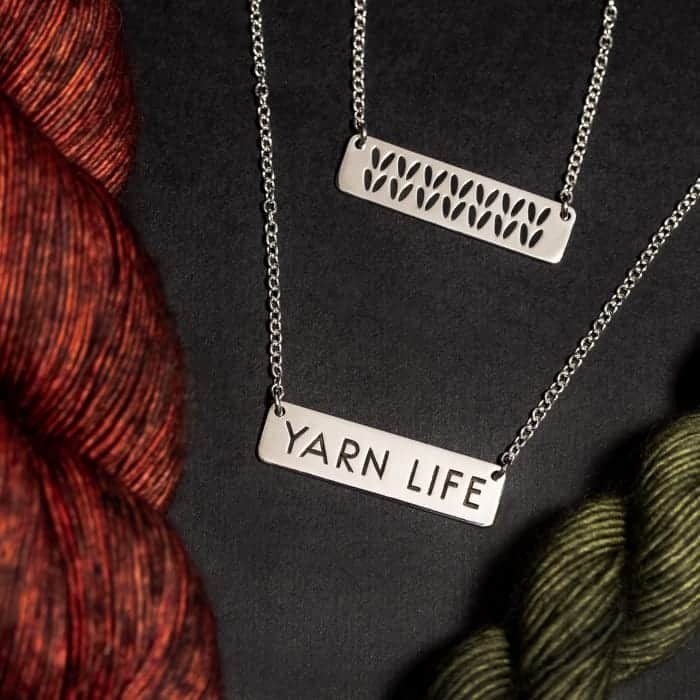 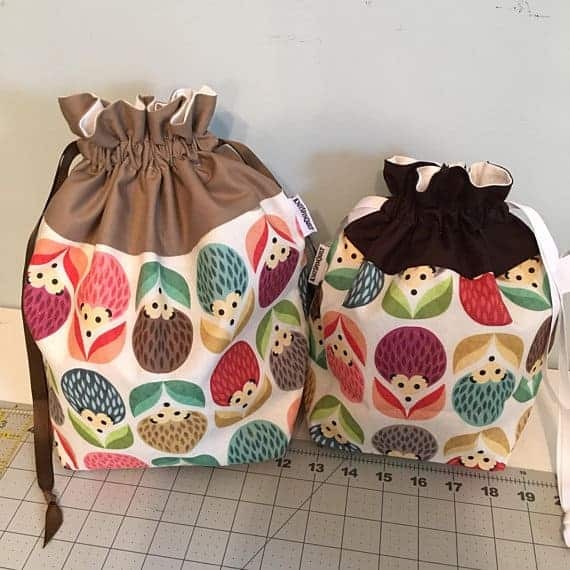 IU newcomer Train Track Fiber Designs was inspired by her location near one of the major rail lines in the Southeastern U.S. Jen, who’s also a podcaster, just debuted some micro mini sets. 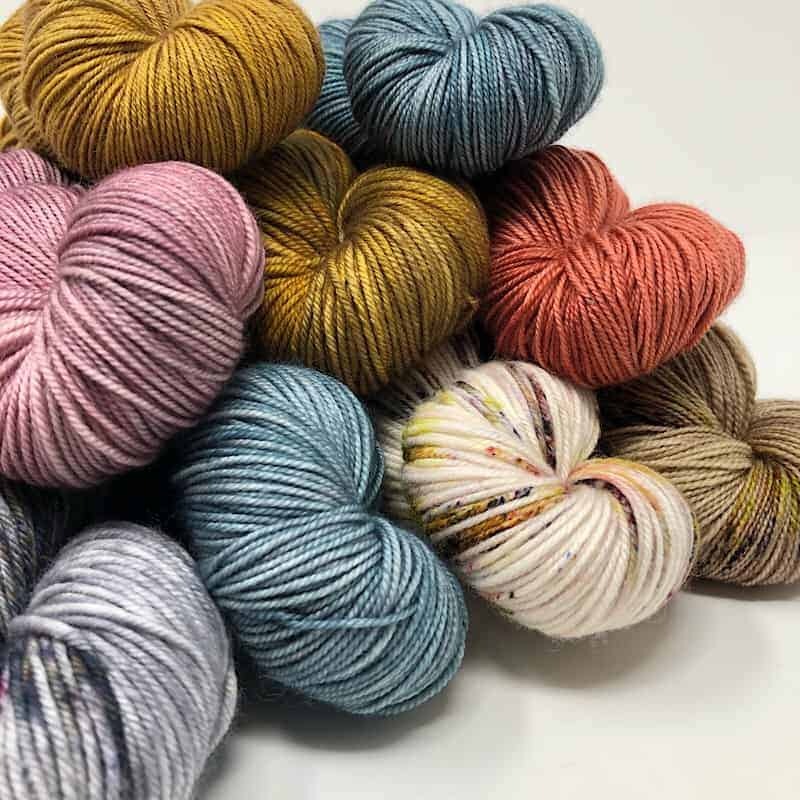 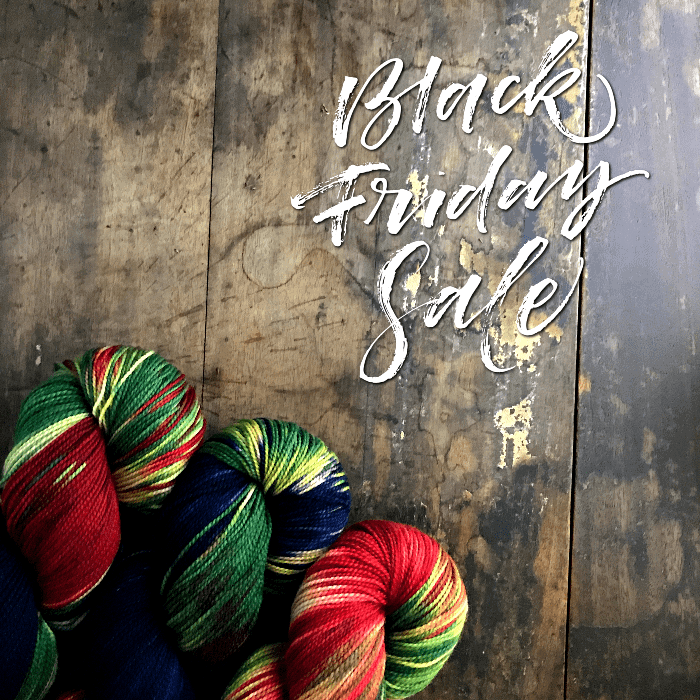 The sets of 10 10-gram skeins are designed for colorwork or wherever you need a pop of brightness.